Has your boyfriend ever made a snarky comment about your obsession with YouTube beauty tutorials? Yes? Let him watch this! 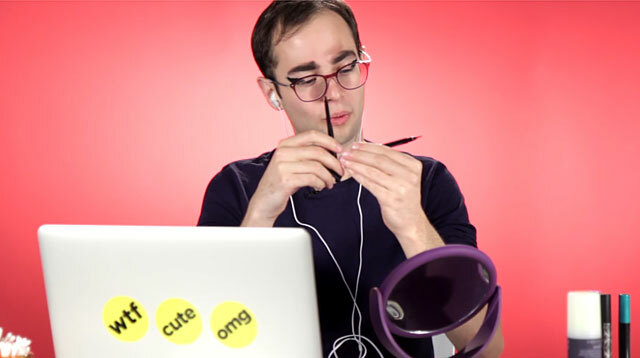 The Try Guys of Buzzfeed came out with this hilarious video of them following different makeup tutorials by Youtube Beauty Guru Michelle Phan. Their picks for this experiment? Midnight Luster, How To Look Like A K-Pop Star, Makeup For A Romantic Date, and Wedding Day Makeup. Watch them struggle with a Beauty Blender, perfecing the winged eyeliner, creating full brows, and piling on the concealer—BECAUSE IT IS GOLDEN. One of the guys even said that he'll stop complaining the next time someone drags him to Sephora, because it all makes sense now. Is your boyfriend up for this makeup challenge, CGs?